If there is one name synonymous with skateboarding, that name should be Santa Cruz Skateboards. For over 30 years, Santa Cruz Skateboards have been making innovative and extremely popular skateboards that professional skaters such as Duane Peters, Steve Alba, Steve Olson, Eric Dressen, and Caesar Singh all ride. With the Santa Cruz Mako Shark Complete Skateboard, Santa Cruz Skateboards have decided to dip back into the history of skateboards with this retro-influenced longboard design. The Santa Cruz Mako Shark Complete Skateboard is an elegant, yet simple design that will provide you with a comfortable ride and allow you to get heavy carves that new and veteran longboard riders will appreciate and enjoy. If you truly want to be seen as a sidewalk surfer, then the Santa Cruz Mako Shark Complete Skateboard is just the board for you. Its design is remarkably like that of a classic surfboard, so if you aren’t able to get out to the beach to carve up some waves, you can at least start carving up the pavement with this beauty. The Santa Cruz Mako Shark Complete Skateboard has taken the same basic shape of the Santa Cruz Skateboards OG Landshark skateboard, and stretched it out. This makes it a bit more suitable for getting big carves on sidewalks. Whereas the Santa Cruz Skateboards Landshark models are 27” long, the Santa Cruz Mako Shark Complete Skateboard comes in at a whopping 33 inches long. A lot of the features are still the same though. It still has the same 65mm wheels, Bullet trucks (B147 instead of B137), and ABEC-3 bearings. Like the other cruzers in the Santa Cruz Skateboards lineup, it also comes with a built-in bottle opener in the deck, which may be the greatest innovation of any skateboard since the kick tail and kick nose. It also doesn’t have grip tape, but instead comes with spray on clear grip tape, so you can see the graphic on the top. This might be the biggest complaint one can have about the Santa Cruz Mako Shark Complete Skateboard at this point. Not the clear grip tape, but rather that the top graphic is merely a white board. It certainly looks very nice and much classier than your standard grip tape would be, but the choice of white on the top of the deck where you stand is questionable. It does get dirty quite easily. A better choice might have been using the same graphic on the top and bottom of the board, or even putting the Santa Cruz Skateboards classic red and yellow logo in the middle of the top to offset the white. 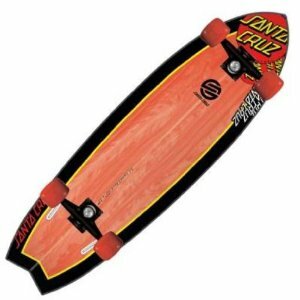 The Santa Cruz Mako Shark Complete Skateboard is another win in the Santa Cruz Skateboards line of cruiser skateboards. Like most of their other offerings, you may want to consider upgrading the ABEC-3 bearings that come with it, but that may not be necessary depending on the type of skater that you are. Currently priced at just under $120 on Amazon (with $25 off) this is in line with the prize of the other Santa Cruz skateboards available today.